Advancements in dental technology have made it possible to revamp your smile to something you’re proud to show off. Dental bonding is just one of the many options available to help restore damaged or misshapen teeth. Dental bonding is often used to conceal visible damage that has been done to a tooth. Dental bonding can be used to fill gaps between teeth, repair a chipped, cracked or decayed tooth, change the shape of a tooth, or used in place of an amalgam filling. Is There Prep Work Involved? Dental bonding requires very little prep work, unless it’s being used to repair a decayed tooth or if it’s too close to a nerve. In these cases, anesthesia may be administered to deaden the nerves so that your dentist can prepare the tooth. In other cases, anesthesia isn’t always necessary. The next step involves “roughing up” the surface of the tooth or teeth and applying a conditioning liquid which will help the bonding material adhere to the tooth. 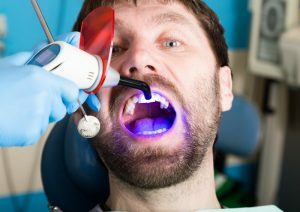 Once the bonding material has been applied, a blue light tool is used to harden the tooth. Once hardened, the dentist goes to work at shaping and polishing it down to look like a natural tooth. Is Dental Bonding the Right Choice for Me? Dental bonding is best used for smaller cosmetic changes and on teeth that have low impact. The bonding material is still susceptible to staining and must be taken care of with a good oral health routine. It’s also important to avoid biting down on hard objects such as biting fingernails, or chewing on pens or ice.